Are these chargers the solution to terrible smartphone batteries? We're in the middle of an energy crisis. It's not about oil or something that can be solved with a breakthrough in renewable energy. The problem is our smartphone batteries can barely eek out enough juice to get us through the day. A San Francisco startup called Doblet wants to fix that with a simple idea: put external batteries everywhere and people will pay to use them. The custom batteries charge in four-packs on counters in restaurants, bars, coffee shops, and co-working spaces. The charging batteries are portable, so you can take them back to your seat or even stroll around the block while charging your phone. There are no awkward passive-aggressive fights over outlets, and each charger can charge an iPhone 6 1.5 times. An app shows you where the nearest locations are. (It will even send a push notification with the location of the nearest Doblet when your phone is low). There are Lightning connectors for iPhones and micro-USB for the rest. To help prevent theft, the chargers only work when you're logged into the Doblet app. 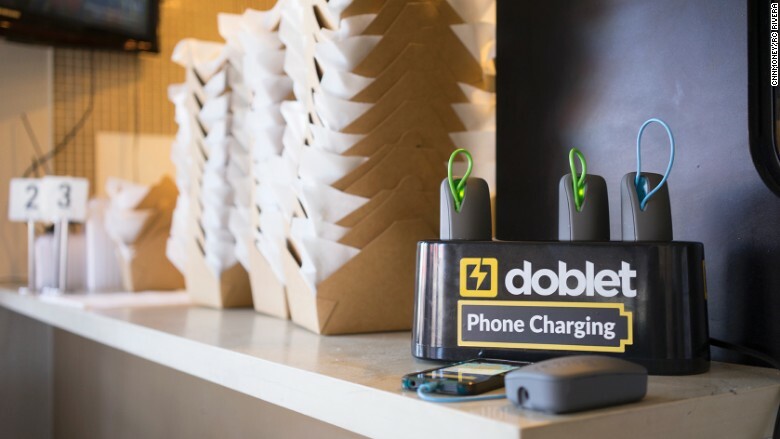 It costs $3 a month for unlimited charging from any Doblet, which users pay directly to Doblet through its companion app. The cafes and bars don't get any money from the Doblets, but the hope is that they'll lure in a few new customers. "What we envision is, rather than charging your phone at night, you know wherever you go there's power. You can just get incremental power everywhere," said Doblet cofounder Doktor Gurson. Gurson came up with the idea at a bar, as one does. His own external battery was resting on the bar when the guy next to him offered a beer if he could use it to charge his phone. Soon, the next guy over made the same offer. The bartender chimed in and said he was asked to charge customers' phones 10 to 20 times a day. A serial entrepreneur, Gurson teamed up with radiologist and AI researcher Jeff Chang on the idea. They went through startup incubator Y Combinator, raised $1.4 million and designed their palm-sized custom chargers. Currently, Doblets are only available in the Bay Area, where the company has battery stations at 350 locations. The San Francisco Public Library system recently made a deal to offer the chargers in all 28 of its buildings starting this summer. The library system will cover the monthly fees so that, like its books and internet access, the batteries are free to all visitors. Since launching nine months ago, Doblet has had 25,000 users. The 12-person company is already working on the next version of its hardware, which will charge twice as fast as a regular iPhone charger. It's also considering adding USB-C options and expanding to New York, Los Angeles and Chicago. The perfect solution would be better batteries in our smartphones. But until that breakthrough comes along, Doblet hopes a peace of mind will be just as good. "Low battery-life anxiety is terrible when it happens," said Gurson.